Reference number for this case: 10-Oct-54-Uzerche. Thank you for including this reference number in any correspondence with me regarding this case. The newspapers Le Populaire du Centre for October 12, 1954, and La Dépêche du Midi for October 13, 1954, reported that there was again an observation of a "ball of fire" from Uzerche, this time on Sunday, October 10, 1954. 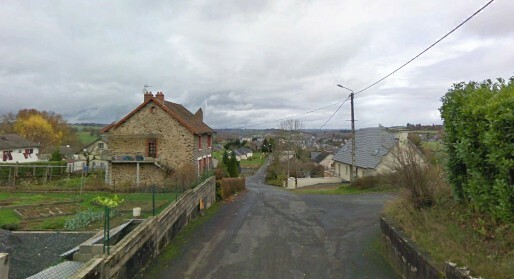 Many residents of Uzerche had seen it in the direction of Saint-Ybard. Some observers were on the heights of La Pomme, others on terraces of the Justice street, on the west side, and it was between 7 p.m. and 8 p.m. approximately. The ball of fire seemed to oscillate up and down, and then disappeared after a lateral movement. It was wrapped in a reddish glowing halo. This "apparition" had been commented at length on the spot, and the newspaper indicates that regardless if it was or was not a flying saucer, the residents of Uzerche could not have been the victims of a collective hallucination since they were in several different places. The observation does not appear to be mentioned in the ufological literature. I checked the possibility that it was Venus but at least the direction of observation does not fit. There was no particularly bright star in this direction either. Near Munster, four "Martians" repaired their "flying saucer"
Munster (Westphalia). 11 August (A.O.P.). - Mr. Hoge, a film operator in his trade, told DPA that he saw four men leaving a flying saucer near Munster on Saturday night. These men, about 1 m 20 tall, have a highly developed thorax and a large head. On the other hand, their lower limbs are small and lean. Mr. Hoge was returning home when he saw a blue light in a field sixty meters off the road. He thought it was a crashed plane and then he realized that the brightness came from an object with a cigar shape. Four men, in rubber suit, worked under the machine. None of them uttered a word. Hoge watched them work for 10 minutes, without getting closer, because he was afraid. Finally the four men, using a sort of ladder, returned into the cigar, which, a few meters after taking off, took the form of a saucer throwing a dazzling light. Sunday evening October 3, around 7:10 p.m., train driver Clavaud André, from the Limoges depot, was driving the train 1547, which leaves Ussel around 6 p.m. On his trip, between the stations of La Celle-Corrèze and Plainartigue, between km 445 and 444, at the end of a curve at 70 km-h, he was suddenly surprised to arrive on a large luminous circumference of about 100 meters in diameter. In his surprise and his emotion, he slowed down his convoy by a violent stroke of the brake, which enabled him to better observe this phenomenon, he extinguished his headlights and was completely dazzled by the power of this pink light beam and as he approached, the circumference moved slowly on the right, overlooking a deserted hill where only heather grows and where he was able to distinguish the few fir trees existing in this country, as if they had been in crystal so powerful these rays were, and when he reached the place of this phenomenon all went off and disappeared leaving a trail of white smoke rising towards the sky. According to collected information, several residents of the area also saw it. We have mentioned that a ball of fire had been seen from the heights of the road to Eyburie in the direction of Espartignac. 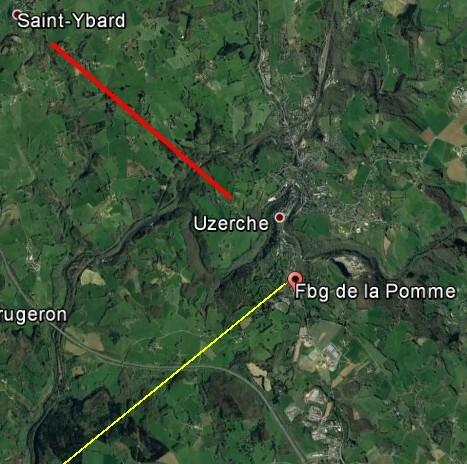 Today we must point out that another ball of fire similar to those seen everywhere was seen Sunday evening October 10 by many residents of Uzerche in the direction of Saint-Ybard. The phenomenon has been observed of the heights of La Pomme, as well as the terraces of the street of Justice (west side), between 7 p.m. and 8 p.m. approximately. The ball of fire seemed to oscillate up and down and then disappear after a lateral movement. It was wrapped in a glowing halo. This "apparition" is discussed at length in our walls. Saucer or not saucer the residents of the Uzerche area were not the victims of a collective hallucination in several districts at the same time. We have mentioned that a ball of fire had been seen from the heights of the road to Evourie, in the direction of Espartignac. Saucer or not saucer the residents of Uzerchois were not the victims of a collective hallucination in several districts at the same time. An observation that lasts, which is renewed, an oscillation and a halo, all this made me think of Venus, sometimes called the "queen of the UFOs". At Uzerche, we are at latitude: 45° 25' 26" N and longitude: 1° 33' 48" E. We are on October 10, 1954, between 7 p.m. and 8 p.m.
My astronomy software tells me that Venus was at 7 p.m. at the azimuth 230° 19' 44" and the very low elevation of 2° 21' 16". It goes below the horizon at 07:21 p.m. So Venus seems possible. It is still not guaranteed since one might think that the observation lasts from 7 p.m. to 8 p.m., and at 7 p.m., it is already very low. At 7:21 p.m. it is no longer visible. Its magnitude is low: -5.5, with only 25.40% of its surface lit by the sun. But we are told of the "heights of La Pomme, thus a place where there may be little obstacle towards the horizon, allowing to see Venus even at only 2° elevation. I found a "Faubourg de la Pomme", indeed, on a height. 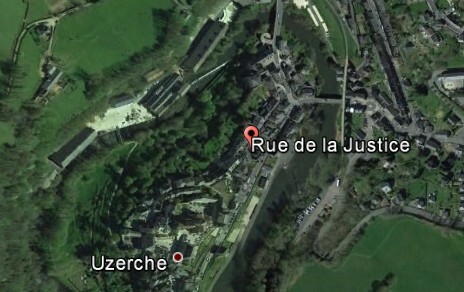 As for the "Rue de la Justice", bypassed by the river, it is also on a height, as if by chance. And we are told that the time "between 19 and 20 hours" is approximate. Luckily, we are given an observation direction: "in the direction of Saint-Ybard." Saint-Ybard is about 4.5 km northwest of the observation spots, at 305° of rue de la Justice, 315° from the heights of La Pomme. 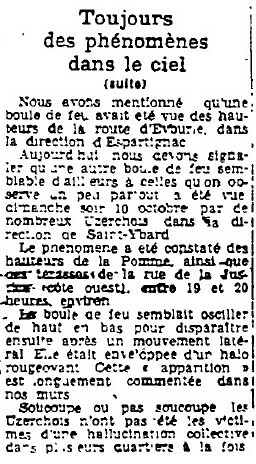 [pc1] Article in the regional newspaper Le Populaire du Centre, Limoges, France, page 3, October 12, 1954. 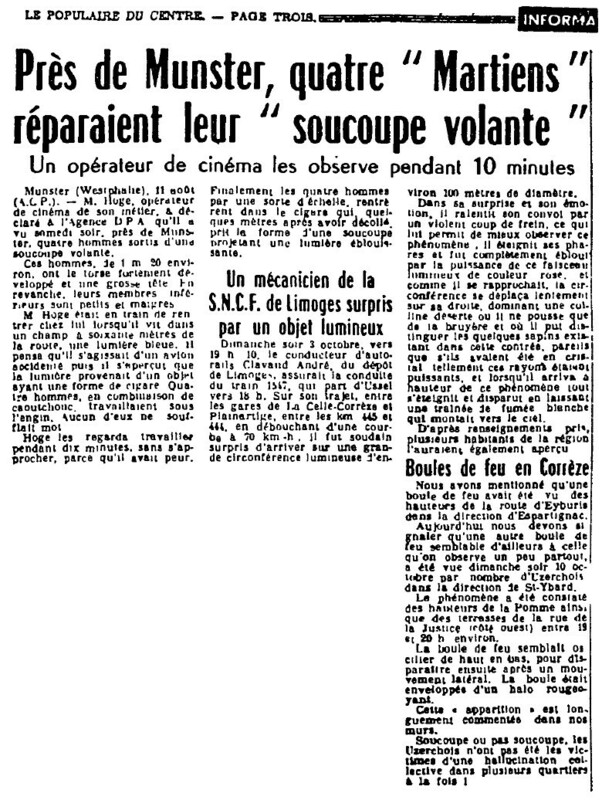 [dm1] Article in the regional newspaper La Dépêche du Midi, France, page 4, October 13, 1954. 1.0 Patrick Gross December 23, 2016 First published. This page was last updated on December 23, 2016.